Mobil Oil Indonesia (MOI) identified Yokogawa as its vendor of choice for all natural gas exploration installations in the north of Sumatra. 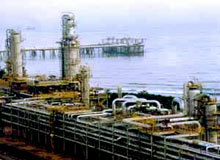 Since the early 1980s MOI has installed a variety of Yokogawa systems in its natural gas liquefication plants, LPG plants, local and remote well-head plants, and booster compression plants. MOI's latest selection of Yokogawa for the expansion of its North Sumatra Offshore A (NSO-A) field production facility was based not only on historical choice but also on Yokogawa's proven track record with installed systems, strong local project execution capability, and service capabilities in Indonesia. The NSO-A facility is divided into two parts, an offshore production platform in the Malaka Strait and an onshore desulphurization plant located at the Arun NGL plant. The total control solution was split between the offshore EPC and the onshore EPC. Overall design and consistency was managed by Mobil and Yokogawa as global partners. The offshore installation is currently operated by ExxonMobil Indonesia Inc. (EMOI) and the onshore installation by PT Arun NGL Co. The offshore configuration was designed so that the platform can be left unmanned during stable operations and be operated from the master control room (MCR). This was accomplished by utilizing dual VSAT links to the platform, which is 100 km offshore. All reporting of the DCS installed on the sea platform is able to be done at the MCR located far inland at Point-A Lhok Sukon (Point-A). The offshore and onshore systems are linked to a variety of subsystems including a safety system, operator boat monitoring system, burner management system, fire & gas (F&G) system, and generators. 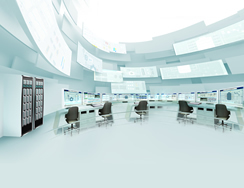 Their connection to an asset management system and a management information system make this a fully integrated plant automation system. From the Point-A MCR, the user can monitor F&G testing, the bypass status and fault status overviews, and the system integrity overview. A special data communication application was also developed that allows for interchange of selected data between the offshore and onshore processes.